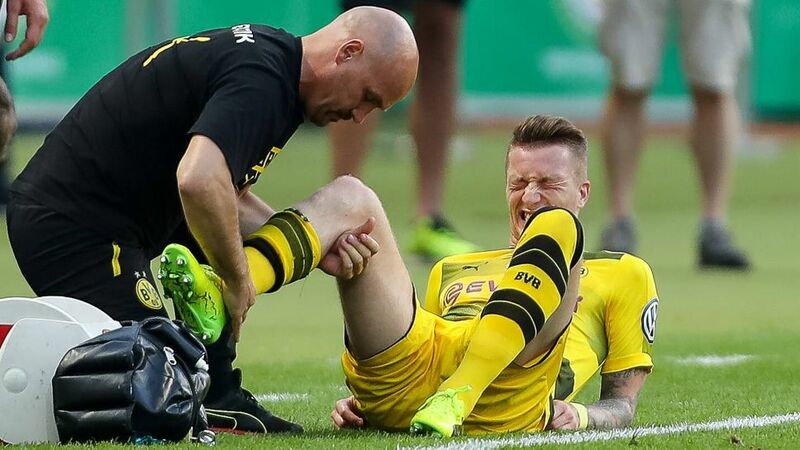 Marco Reus is set to miss the whole of pre-season and the start of the 2017/18 season after it was confirmed that he had partially torn his cruciate ligaments in the DFB Cup final win over Eintracht Frankfurt. The Dortmund forward, whose season has been blighted by injury, picked up the injury early on in Saturday's 2-1 win at the Olympiastadion. Although he played through to the end of the first half, he did not emerge for the second 45 minutes and watched on as Pierre-Emerick Aubameyang netted his side's winner. Preliminary tests were performed upon Reus' return to Dortmund on Sunday, although confirmation only arrived on Monday, when he underwent more in-depth examinations in Munich. The 27-year-old will need surgery, with Dortmund therefore refusing to put a precise timescale on his return. A return is however unlikely before the end of August, when the new Bundesliga season will already be in full swing, and just a fortnight before Dortmund's debut in the Champions League group stage. Reus missed 16 games due to injury in 2016/17. When he did play – on 17 occasions – he made a difference, with seven goals. In four Champions League appearances, he scored a further four goals and will be sorely missed by the Black-Yellows at the start of next season. Click here for more Borussia Dortmund news.